So our first-ever #Pedal4Charity week is now history. We had a great time welcoming many groups to the bike. 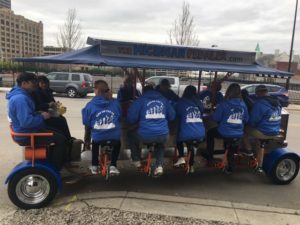 In March, we announced this initiative and offered spots to ride The Michigan Pedaler to charities that applied to participate. While we could not accommodate every charity, we were happy to assist many worthy causes. The groups on the bike were many and varied. We assisted with raising money for college text books for inner city students, homeless people, Autism Alliance, Special Olympics, Goodfellows, and a furniture bank just to name a few. Kids on the Go raised money on the bike Friday night. They came decked in their own sweatshirts. In all, we believe we helped raise somewhere in the range of $15,000 for various causes. 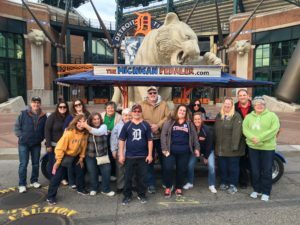 While most groups raised somewhere between $400 and $800 per ride, Hatch Detroit, proved to have the most successful fundraiser. They asked people to pledge for their ride similar to how one does for a walk-a-thon or marathon. The number keeps growing as the pledges come in but from the last report we received, they had raised over $7000! Hatch Detroit serves the community by providing a contest each year for entrepreneurs that are looking to start a business in Detroit, Hamtramck or Highland Park. You may be familiar with some of their past winners such as Hugh, La Feria, Batch Brewing and Sister Pie to just name a few. Congratulations on such a great promotion. 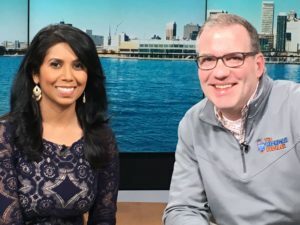 WXYZ’s Anu Prakash interviews Michigan Pedaler owner Mike Gill about the company’s #Pedal4Charity Week. 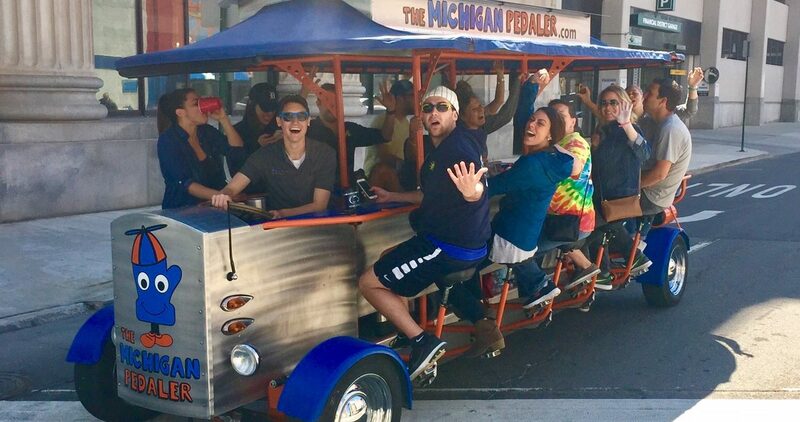 On Saturday during #Pedal4Charity week, Channel 7 (WXYZ) featured us and our event on their morning news. You can watch our interview here. Thanks to reporter and anchor Anu Prakash for being such a gracious host. We hosted this #Pedal4Charity week as a way to say “thank you” to all of our supporters who have come out on the bike over the past year. We are now just over a year old and we certainly appreciate all the support we’ve received from people who have decided that they wanted to try this new endeavor. We thank you for your support and loyalty. This is a small way for us to say “thank you” back to the metro-Detroit community. While our #Pedal4Charity event is now history, we still like to support outstanding and worthy causes. If you have a charity event coming up, please feel free to get in contact with us about the details and we will see if there is some way we could help. Fraser First raised money to support construction of a barrier-free park in their community.